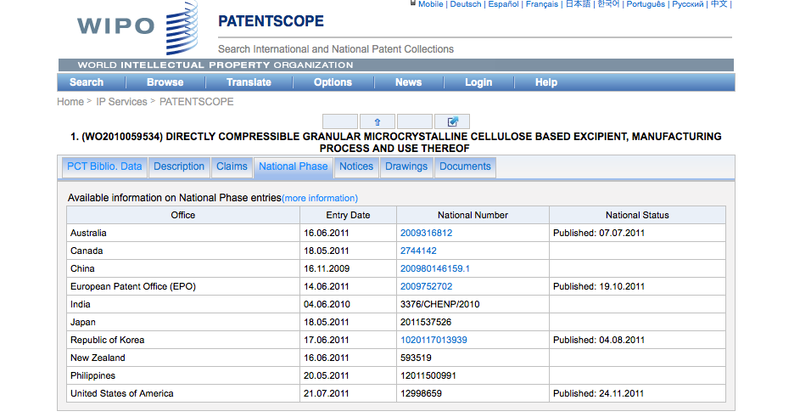 Which is the first country to file patent on DIRECTLY COMPRESSIBLE GRANULAR MICROCRYSTALLINE CELLULOSE BASED EXCIPIENT, MANUFACTURING PROCESS AND USE THEREOF ie. patent no. EP2376067 and whether the patent is granted or not..?? It looks like the first filing was a US provisional application 61/116,025 filed 19.11.2008. That was followed by a PCT application with Filing Date: 16.11.2009 published as WO/2010/059534 on 27.05.2010. On the same day, Nov 16, 2009, a US application published as US20110288146 was filed. Later, the national stage in several countries was entered. I do not see that any have issued as patents. Not the answer you're looking for? Browse other questions tagged filing ep2376067 or ask your own question.